There are daily flights at regular intervals with South African Airways and Kulula.com between Mpumalanga–Kruger Airport and Johannesburg, and once daily between Mpumalanga-Kruger Airport and Cape Town. There are also flights available to and from Victoria Falls as well as Maputo in Mozambique. You will be met at the airport near Nelspruit from where you will be transferred to Kruger National Park. 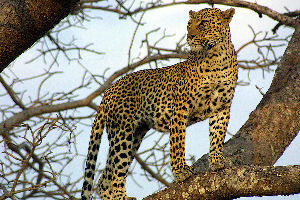 Kruger National Park is South Africa’s largest and best known game reserve. The bio-diversity of the park is extraordinary. More than 600 species of birds and numerous plant species can be found in addition to a variety of big game, of which the Big Five are often sighted. 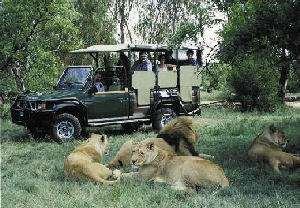 You will have an open safari vehicle with a very knowledgeable game ranger to serve all your needs, 24 hours a day. Game drives will be unlimited. The pace will be set by your group. One game walk is included. This game walk will be with game rangers from Kruger National Park. Other guests in the Park will also probably also partake on this game walk. The rest camp (lodge) where you will overnight depends on availability of accommodation at the time of your booking. To stay outside of the Kruger National Park is just not the same experience as within the Park. The accommodation might be more luxurious outside of the Park and Temba Tours are aware that you would be able to have a better hotel in your home country or elsewhere in South Africa. The hotel should certainly not be your first priority when you are on safari. Keep in mind that Kruger National Park is fenced off. If you stay outside the park you simply miss the activities of the game at night. Over and above this is the fact that a Kruger National Park Safari is an experience offering far more than just game drives. The barbeque fires in the rest camps add to the atmosphere, while the night sounds all add to make a Kruger Safari the highlight of any South African tour. On a Temba Safari you will certainly experience all of the above. Accommodation in Kruger National Park is in chalets. The locals call it “luxury” but it is certainly not five star accommodation. However, it will be clean, air-conditioned and you will have a veranda where you can relax. All rest camps have curio shops and other convenience stores, a large swimming pool as well as a good restaurant. his tour includes all meals, all game activities and return airport transfers. The first bottle of wine at dinner will be suggested by your private game ranger at his discretion and he or she will also settle the bill. All other beverages will be for your own account. 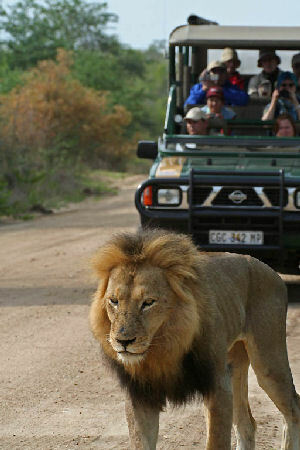 You can also consider other Temba Tours or Safaris and popular privately guided Kruger National park Safaris. Here is a useful map guide to the Kruger National Park. If you are looking for more luxurious accommodation visit the website of Krugerbooking.com for Sabi Sabi Earth Lodge prices. The Grand South Africa Tour is a long tour and includes the highlights of South Africa. The Luxury Namibia Safari includes all the highlights of Namibia. The Arid Region Tour combines Highlights of South Africa such as the Namaqualand flowers, The Richtersveld National Park, The Kalahari or Kgalagadi Transfrontier Park and Namian highlights such as Fish River Canyon and the Quiver Tree Forest in one tour. The Eastern South Africa Luxury Safari is a safari tour and it includes Kruger National Park, the Panoramic route, Swaziland, Zululand and the Kwazulu Natal Drakensberg Mountains. 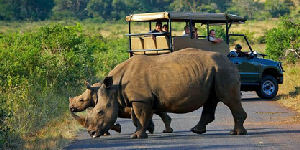 Also visit Southern Circle Tours and Safaris for more Kruger National Park Tours. Avid Birdwatchers can visit the page of Safaria for Kruger Park birding safari info. Britstown Transkaroo Lodge offers luxury and affordable accommodation in Britstown in the Great Karoo and Northern Cape Province of South Africa. Cape Cross Lodge your gateway to the Skeleton Coast in Namibia. This lodge is north of Swakopmund and Henties Bay. Kob Inn is a resort along the Wildcoast of South Africa. The family resort is both luxurious and affordable. .
Ngepi Camp is in the Caprivi in Namibia and is one of the Caprivi’s famous lodges. Ngepi Camp is on the banks of the Kavango or Okavango River. 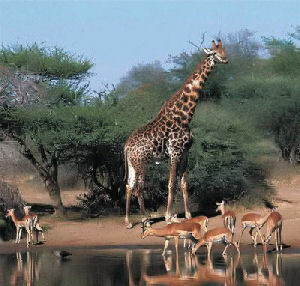 Temba Namibia is well-known for excellent tailor-made tours to Namibia and Botswana. Ugab Terrace Lodge overlooks the Vingerklip Rock formation near Khorixas in Namibia. This lodge in built on a hill with breathtaking views. Sikumi Tree Lodge is a very extraordinary lodge at Hwange Game reserve in Zimbabwe. The lodge offers excellent accommodation and safaris through this game park. A’Zambezi River lodge is the only hotel on the banks of the Zambezi River a few km upstream from Victoria Falls in Zimbabwe. This is a a luxury hotel with a very peasant and relax atmosphere. Francistown Hotels such as Thapama Hotel, Marang Gardens hotel and Woodlands stop over self-catering ( self contained ) accommodation and camping. Sossusvlei Desert Camp is only 5 km from Sesriem at the entrance to the Sossusvlei Park in Namibia. Desert Camp offers luxury self-catering ( self contained ) accommodation.